Musical Fidelity LX2-LPS review | What Hi-Fi? Musical Fidelity’s LX2-LPS is a differently but overall equally abled alternative to the imperious Rega Fono MM MK3. Musical Fidelity’s LX2-LPS and the Award-winning Rega Fono MM MK3 – the competition for any product entering this market at this price – are split by their differing talents rather than one or other being in particular ascendency. The LX2-LPS is of course our focus for this review, though it splits its own by the way of offering amplification for both moving magnet and moving coil cartridges. Catering for both, especially to do so adeptly, is a rarity at this price given the extra work involved with the latter. That a decent MC cartridge alone would likely set you back more than double the price of this unit, and that’s not to mention the cost of the rest of a suitable deck, means we wonder how much use will be made of this feature. Still, its presence can only be regarded positive – even if it were only for the fact it facilitates a second toggle (indisputably king of all switching systems) on the front of the unit. Just generally this is a classy little product. Naturally, as a phono amp, its appearance is clean cut – this is a game played very much behind closed doors – but its build is solid and symmetry fundamentally pleasing. The LX2-LPS also boasts adjustable impedance, which is again of near chicken-tooth rarity at this price. Rather than a switch, there are two sets of loading plugs on the back of the chassis for you or, more likely, your dealer to do the job manually. At this price it would be surprising to find many buyers making use of the feature. 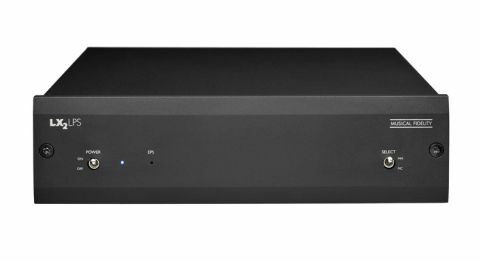 An entry-level phono amplifier is usually fit-and-forget out of necessary convenience as much as budget, and, given what we’re about to say about the LX2-LPS’s native performance, there’s no real need for customisation regardless. Still, it’s of no inconvenience having the option. So, to that sonic performance. Simply put, this is a Musical Fidelity product that sounds precisely like most Musical Fidelity products, and in a tremendously positive way. Using a moving-magnet cartridge, as we did for most of our testing, we play Aphex Twin’s Selected Ambient Works 85-92 and relish the LX2-LPS’s familiarly spacious and full-bodied presentation. There’s a lot of low end, which warms up the performance noticeably but steers clear of becoming invasive or overly corpulent. There isn’t the punch or rhythmic precision of the Rega Fono MM MK3, which loses it some ground on more driven tracks, but still the music times quite well enough and is far from lacking generally in terms of dynamic reach. The difference is really that the Rega scores consistently high across the board whereas the Musical Fidelity’s talents are more varied – and it’s with slower, more reflective pieces that the latter is truly able to shine. Lewis’s L’Amour, for example, sounds as if it were produced specifically to be played on kit such as this. The LX2-LPS’s creamy full-bodied presentation buoys meandering piano lines and luscious synth pads, with the vocal presented gorgeously with a combination of warmth and dulcet expression that suits Lewis’s croon to a tee. Arrangements focused so considerably on the middle register are a delight through this phono amp, which revels in those frequencies, but a combination of that aforementioned space and a generally balanced overall range safeguards against the pieces becoming compressed or insular. If you are planning to make use of the MC input, the LX2-LPS’s character happily remains the same. We use our reference Clearaudio Innovation Wood/ Stradivari V2 combination, which is certainly not this amp’s ideal bedmate. But we can’t say the Musical Fidelity is out of its depth, simply continuing to do well what it does and somewhat justifying the inclusion of moving-coil input. As competition for the Award-winning Rega, the LX2-LPS is perhaps not as versatile, but where it thrives it delivers a more engaging performance, and one that comfortably validates a five-star review.